It’s beginning to look a lot like Christmas, everywhere you go! And everywhere has finally come here to our lil’ ol’ farmhouse. Oh how I love this time of year but I hold off decorating for Christmas until after Thanksgiving and that is today! So the first thing that needs to be done is the front porch because if you think about it, that’s the most important part. 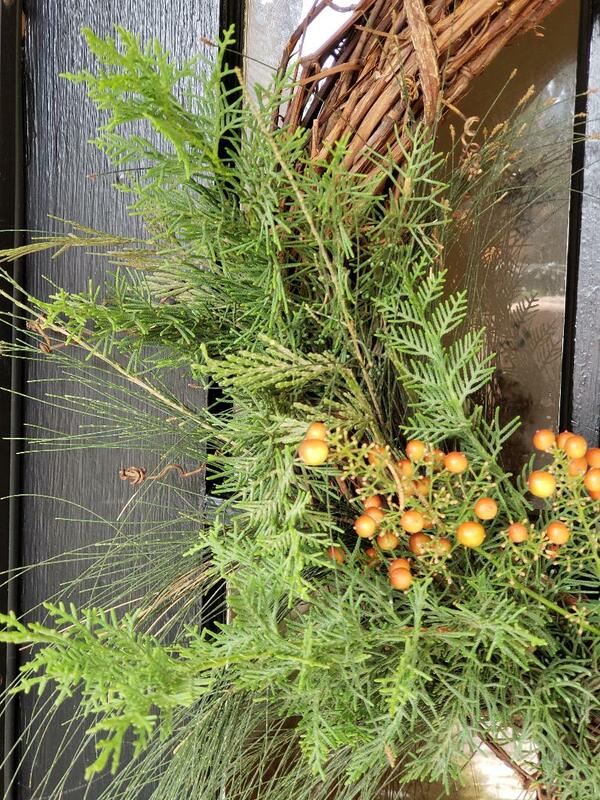 It’s the entrance into your home, the first impression, and it sets the stage for the rest of your theme. So, without further ado, this year’s theme is “WHITE CHRISTMAS!” Or rather, “I’m dreaming of a White Christmas.” We don’t get much snow here in the middle of California. But hey, it’s a farmhouse, and it’s white, need I say more. Although, I have found myself so inspired by what’s out in nature, what’s growing on the farm, what could be simple; homemade and handmade. 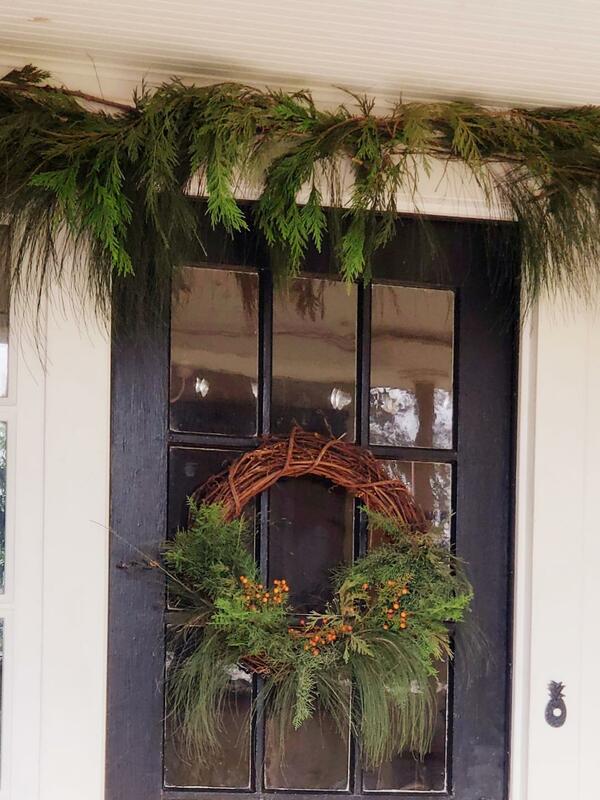 As I transform our front porch into a WHITE CHRISTMAS theme of simply sweet natural elements from the great outdoors, I hope you will be encouraged to create your own winter wonderland decor with some inexpensive elements and a little creativity too! In fact in 4 simple steps, I’ll show you how to create for yourselves this same theme. 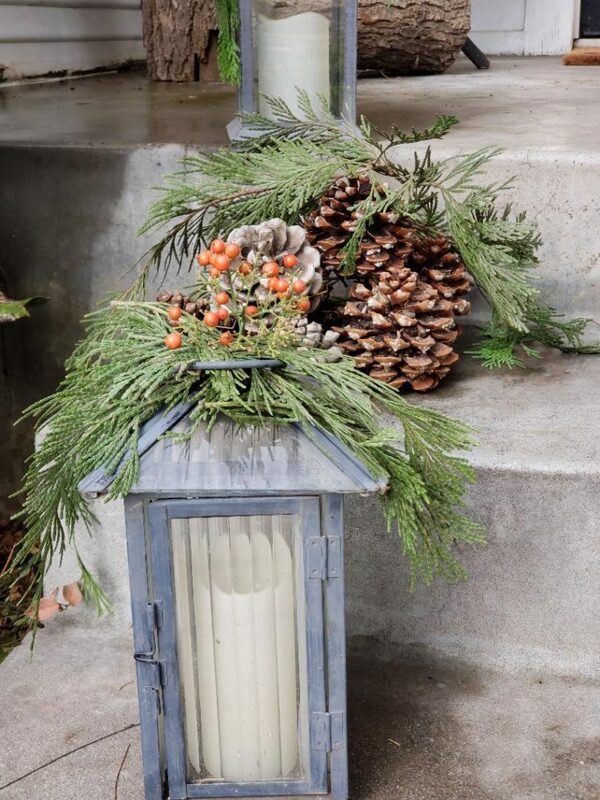 4 STEPS FOR A NATURAL FARMHOUSE CHRISTMAS PORCH! I start off by taking down the fall so I have a clean slate. Then I know I want lots of those natural elements so I traveled through the yard looking for evergreens and I found these beautiful cedar and pine trees. 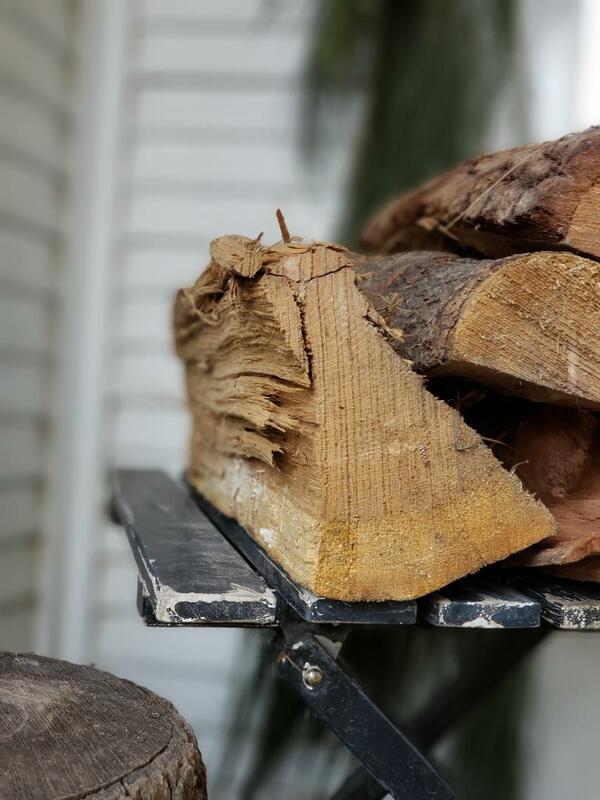 Pruning branches off the trees is easy enough and giving them a little hosing down is too. Next, I take all of these branches and start planning out my vision of creating and enchanting entry way that crowns the opening into our home with the sweet smell of freshly cut boughs of these evergreen beauties. 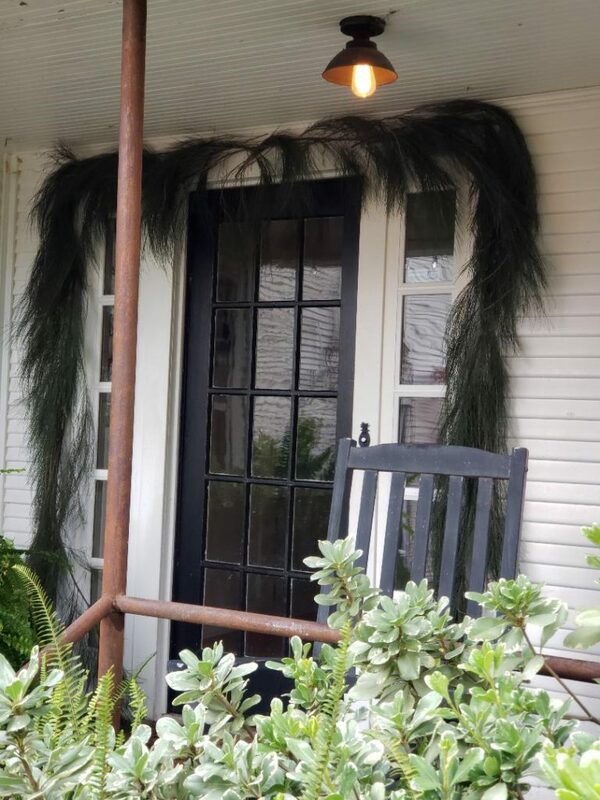 So to achieve the look I want, I prepare to make a fresh garland around the doorway by taking some sturdy jute twine and cutting it so it will fit all the way around this area. 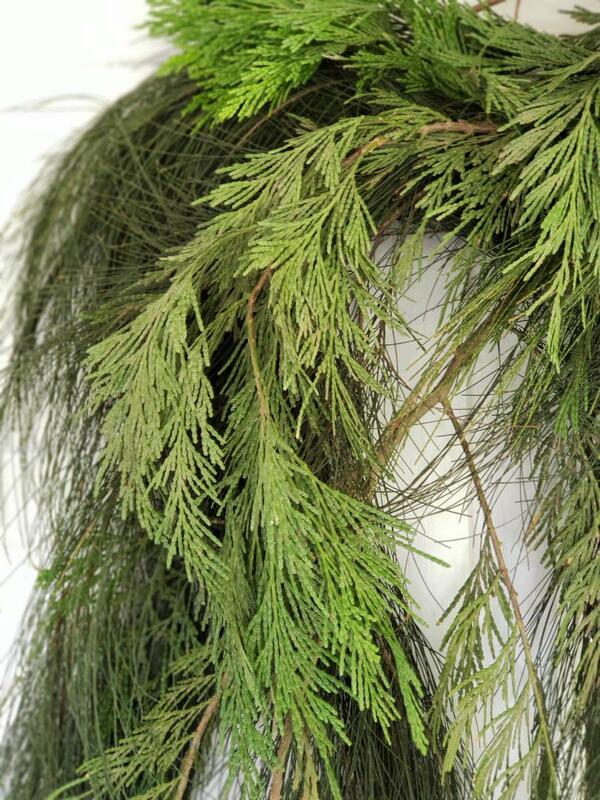 I begin to place the boughs on the jute and I tie them into place with some extra jute. I keep adding more to it by overlapping them while stepping back now and then to make sure I love how it’s evolving. Yaaay! I’m loving it so far. 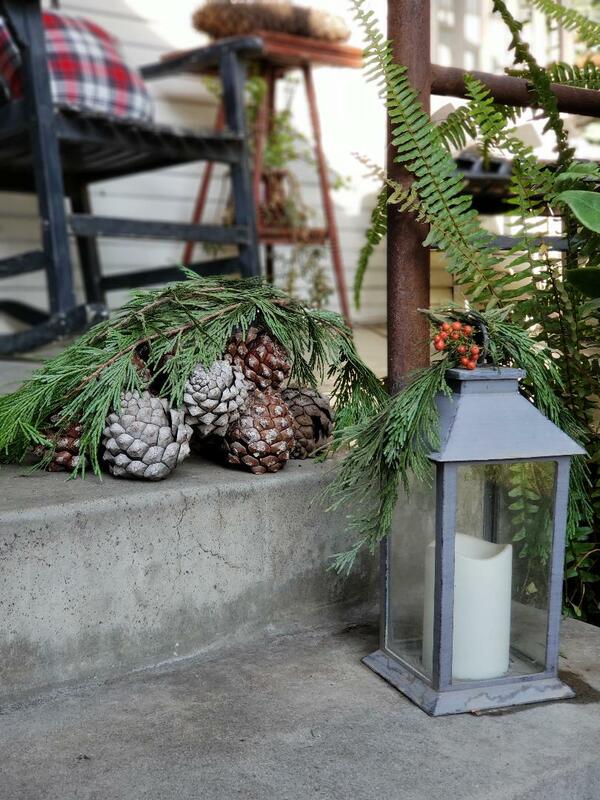 We have a variety of pine cones from our yard, so I gather them too along with some other greenery to add interest and highlight using what we have that’s right here. I feel that when you use your own bushes and shrubs it makes for such a pretty, natural picturesque view that accentuates who your home is! 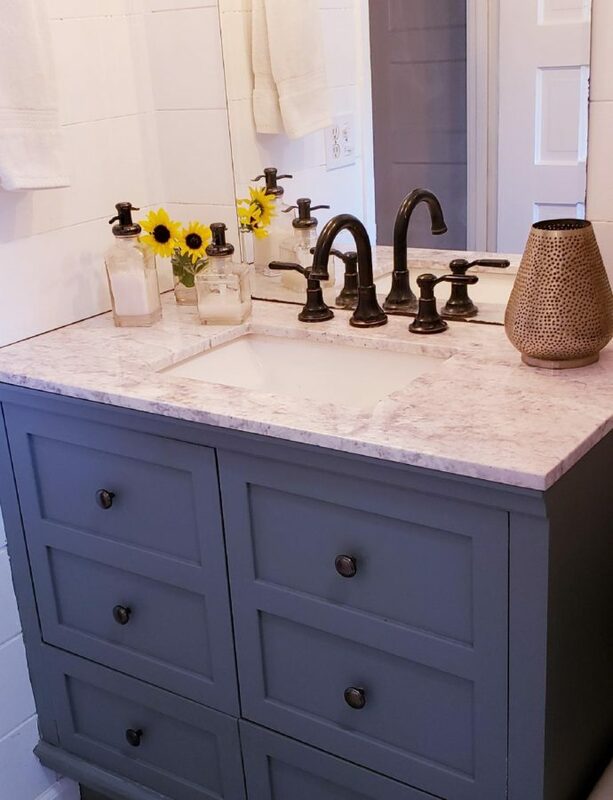 It’s your home’s own style! Now it needs just a little bit of “White Christmas” twinkle lights woven in to brighten it all up as the skies turn dark and grey. 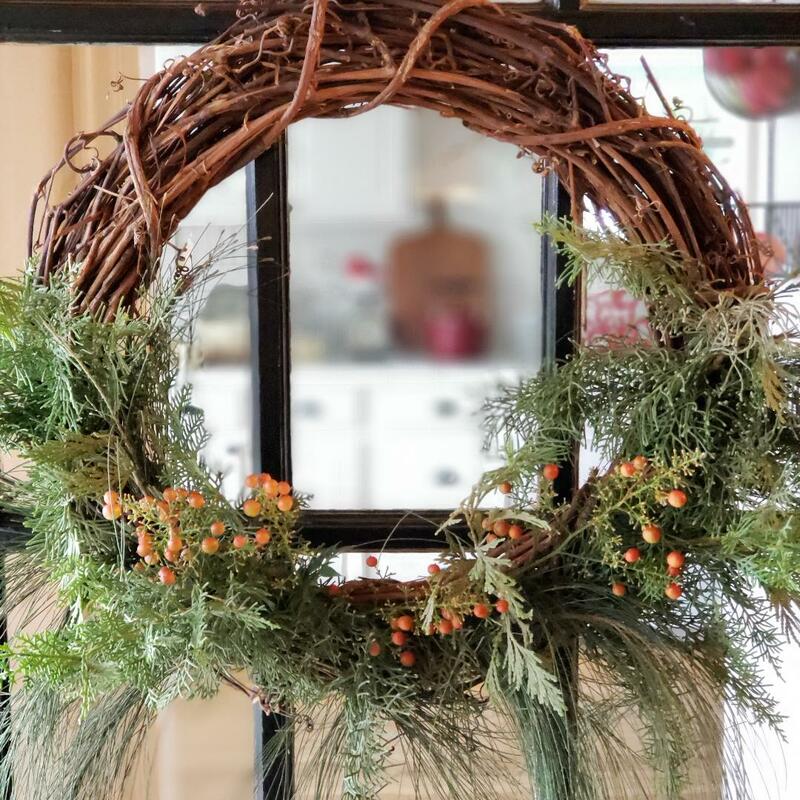 To compliment the beautiful natural green garland and woodsy pine cones on display, I used a wooden grape vine wreath and instead of covering it all up, I let that beauty show off. 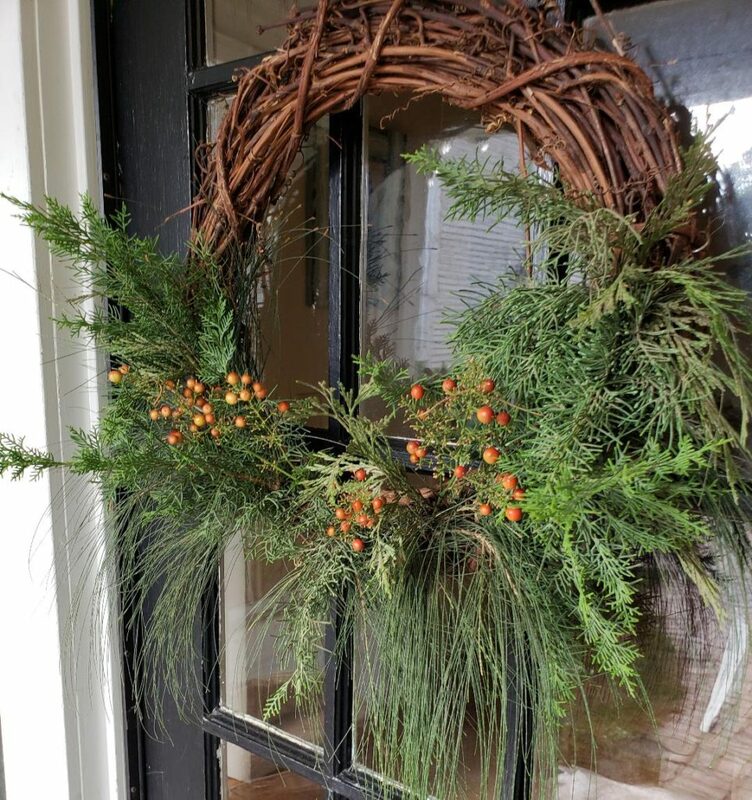 I used a few of the green branches and trimmed them to fit perfectly, a little on the right and left of the bottom of the wreath. Then I used some red berries found from a Nandina bush in our yard that looks like holly berries and adds such a nice red accent that matches the red, white, and black plaid pillows. 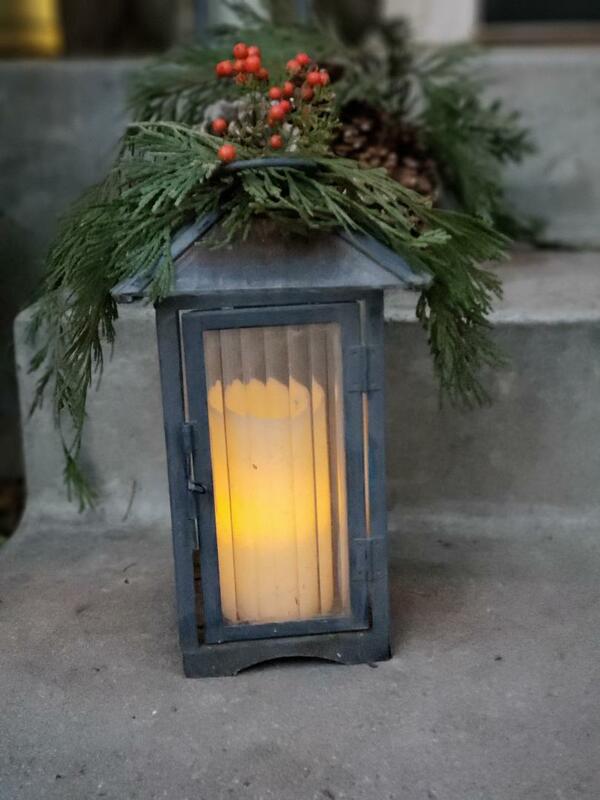 Let’s keep that lighting going with these antique lanterns that light up the way at night for visitors to feel welcome as they enter into our awaiting home. But are they really antiques? No, just some reasonably priced ones I found at Amazon (click here for link). They come with battery operated candles in it of course for safety and so that they can be lit up every time it gets dark and dreary through these upcoming winter days and nights. I topped each lantern with some more greenery and a bit of mini pine cones on top as well as scattering some more pine cones of different sizes in and around all of these beacons that symbolize the glowing warmth of hope and love that represents our families’ wish for everyone this Christmas. 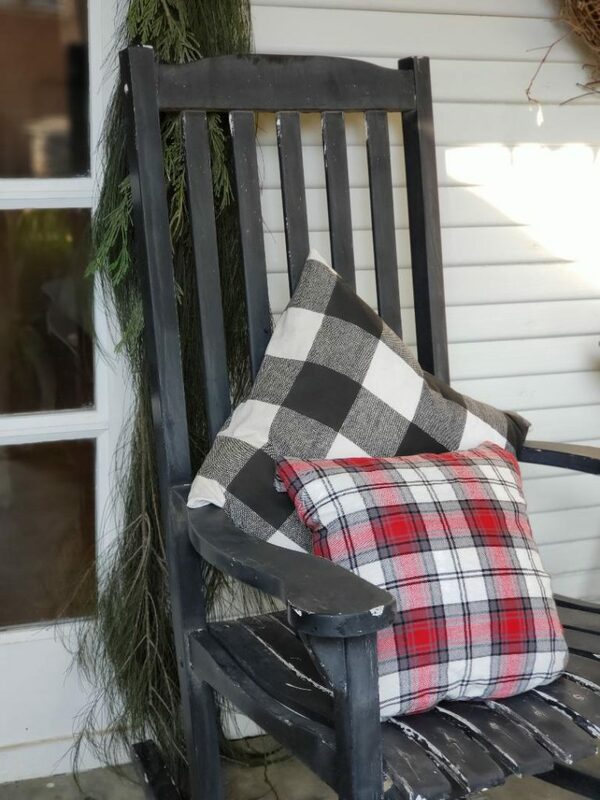 Let’s just keep that sweet Farmhouse look going with these plaid covers over the pillows that I made for these old fashioned rockers. I can’t tell you how many times I’ve watched the movie “White Christmas!” And while it was filmed in the 1954 on a Hollywood set, the image created was one of an old Farmhouse Style Inn that was turned into a Ski Lodge in Vermont. Even though the time period is in the 1950’s it has such a timeless style that I have always adored. I think these plaid pillows on the rockers capture that same vintage inspiration. 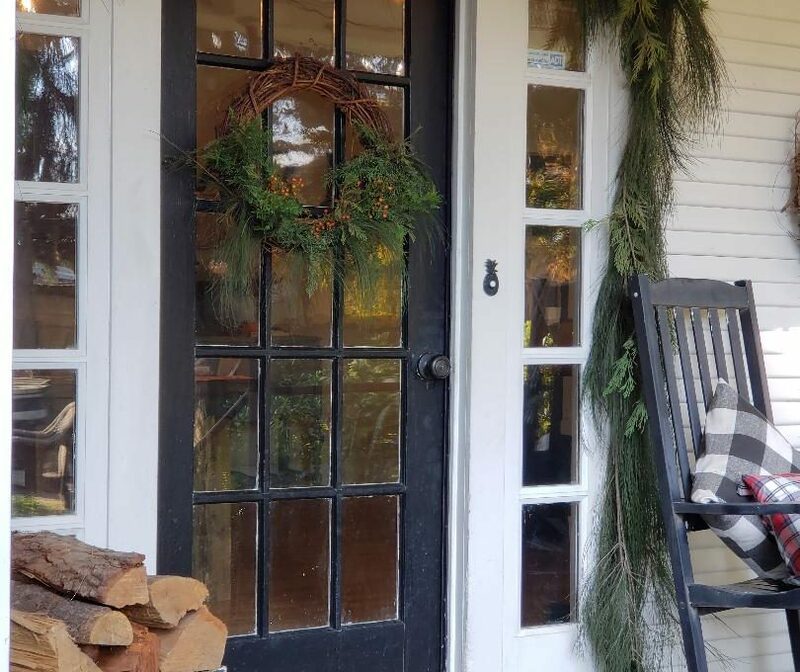 This Natural Farmhouse Christmas Porch is ready for one and all to join us for some Christmas Cheer! It really was inexpensive and fun to do when you use what nature offers you and have fun creating your own vision of a Christmas theme! 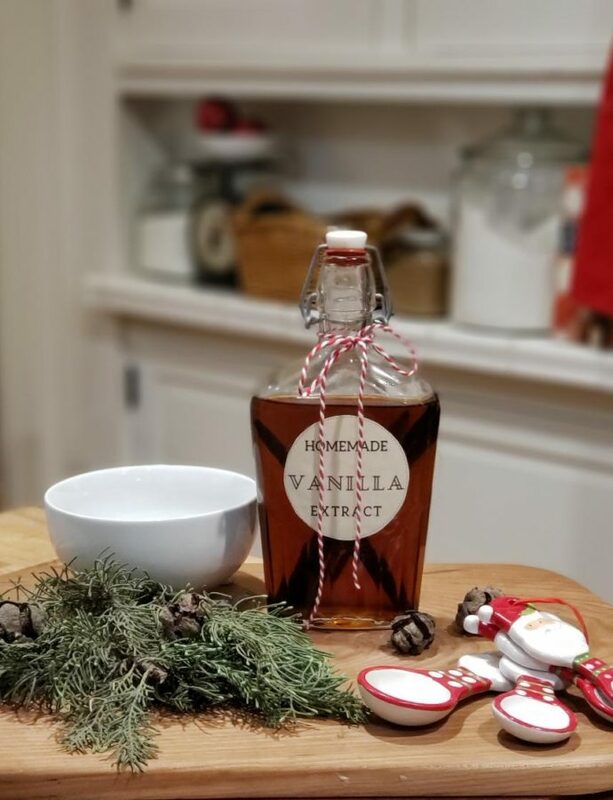 Play your favorite Christmas Carols and sip a little Eggnog while you work! I guarantee if you do, every Grinch that lives in your house might just change into a jolly old Santa before you’re done. Then step back and enjoy the fruits of your labor. As I do, I can almost hear sleigh bells in the distance as I dream of a “White Christmas” just like the ones I used to know. I guess like ol’ Bing and Rosemary Clooney, I’ll be a waiting and a waiting for the snow but a dreamer can dream! 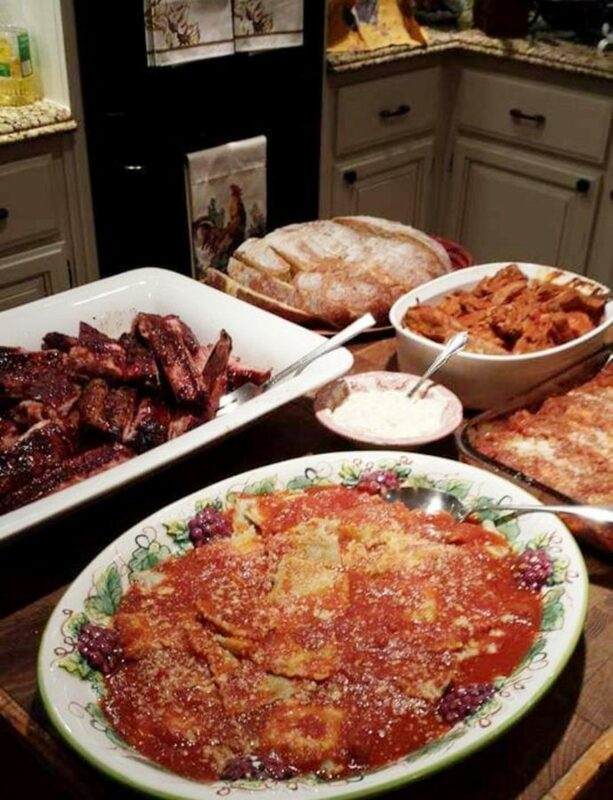 Hope you and your family enjoy the start of this glorious and most precious time of the year! May your days be merry and bright and may all your Christmas’s be white! Love the porch! It looks so inviting. Thank you sweet Tam! 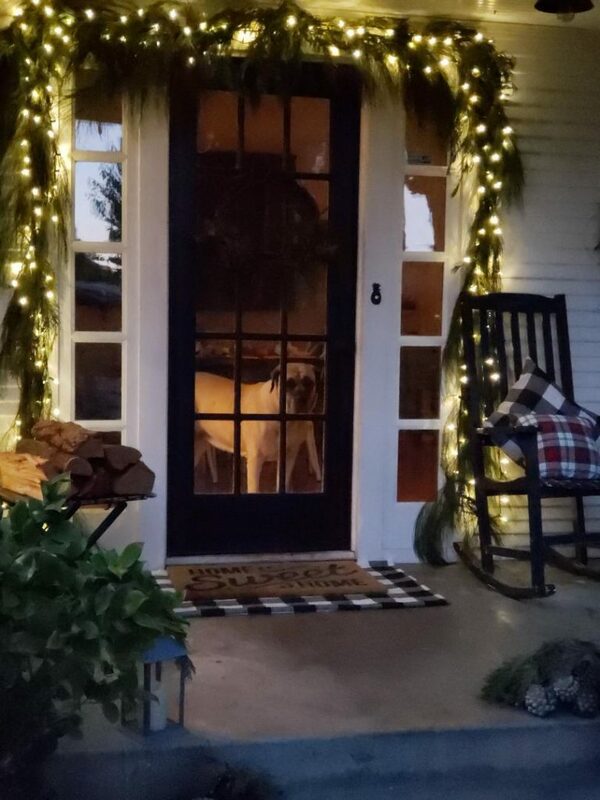 It starting to feel like the Christmas season is here with the porch done now! Looks so inviting. I’m ready to decorate! Yaaay! Thank you and I can’t wait to see all of your decor Mama! Love you bunches! So pretty! I don’t do a lot outside (that’s my hubby’s job) because it’s so cold here now but I really like the look of this. Maybe one of these days I’ll get brave….or maybe not! Hubby’s goal is to make it so our house is visible from space, so you can probably imagine what our front porch looks like (Griswolds anyone?) Ok, it’s a bit nicer and not as garish as the Griswolds’, but definitely not this rustic and cozy-looking! Oh Dawn, you have to post a picture when he’s done! I’m dying to see it now! Stay warm my friend. I love this, Jerri! Great job! It’s so inviting and homey looking. I’m really loving that black rocking chair you have on your porch. I’ve been wanting one for mine for some time now and can’t find a nice vintage one. Oh well! By the way, it’s never really Christmas for me until I’ve watched “White Christmas” at least once! And have you yet? I’m the same way, so every Thanksgiving while I’m cooking in the kitchen I have it playing like all day long. Ha Ha Oh, and I got the rocker at Walmart a few years back. XOXO sweet friend! Oh and I loved your table scape today! 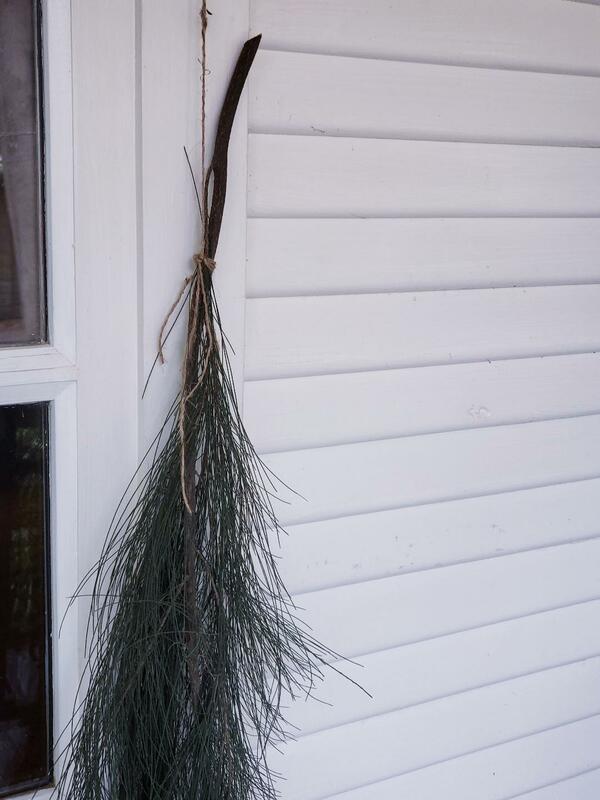 You always have the cutest porch decor. You need to come over to our home and give me some pointers. well….maybe just come and do it. I will have some sweet tea for ya”. Oh Terrie, wouldn’t that be so fun!!! We would talk, craft, and decorate all day! What a party that would be! Thank you my sweet friend! I loved your table scape today btw! The porch looks fantastic! I love the garland over the door and the use of the lanterns! Thanks for the inspiration to get mine decorated! Oh and the pup in the door is the cutest!! Hi Cate! Thank you so much! I just checked out your blog, so beautiful and inspirational! Thank You for Checking it out Jerri! Oh my gosh, I love your blog. Just started following you! Can’t wait to read through your posts. So fun! Just perfect! 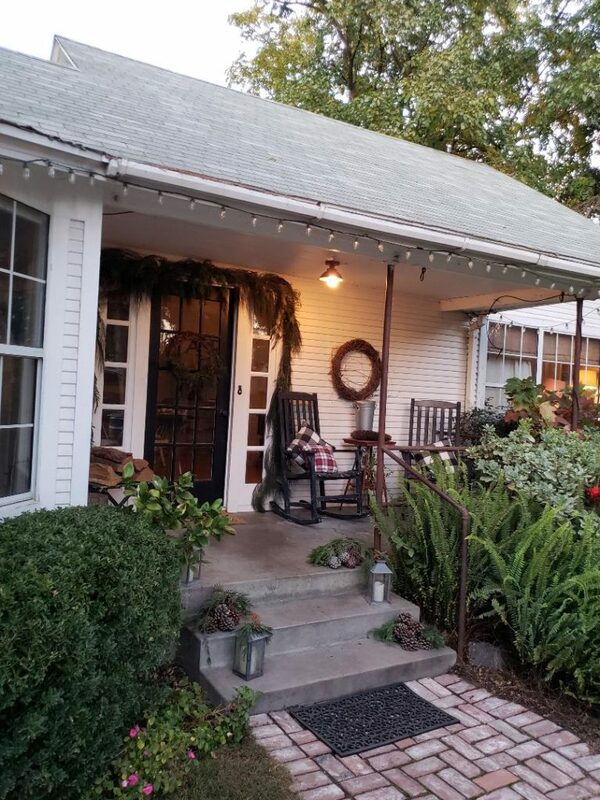 The picture of the whole porch looks like a magazine cover. Every element from the pillows to the lanterns to the greenery is just perfect. Oh you are so sweet! Thank you so much for you sweet compliment! I LOVE very detail!! Such perfect festive touches! Pinning now for next Christmas!! Hope you have a wonderful weekend, my friend!!! Oh thank you sweet Emily!